Graphic design started as a hobby of mine in the form of uniform design. I drew up new baseball uniforms when I was only 10, and they became a reality at 14. I have always been a huge fan of designing wrestling singlets as well, some of which have turned from idea into reality by now. From uniform designs, and upon taking on role of Director of Social Media for Lockport Wrestling, I've branched out into further design work in an effort to enhance my skills and our online presence. This has included making promotional images, posters, flyers, logos, and continuing with some clothing and uniform designs. The slideshow/gallery below features both concept art, concept designs, and actual items that have come to exist. Need something designed? Great! Let me know and I'll see what I can do. While I've listed my areas of experience above, I'm also up for a new challenge. If what you need is beyond my abilities, I will let you know upfront so that your time is not wasted. Rates: Rates for graphic design are ENTIRELY based on the final product, NOT on time to completion. I choose this route because if it requires me to learn something I've never learned, you shouldn't pay more because I have to learn the new skill. That said, there is no flat rate - contact me for any quote. Rates are based on the type of design work needed and complexity of design. All designs come with two free revisions, because I know that what you have in your head isn't always what the final product is. Further revisions cost 20% of the initial rate. As always, please do not hesitate to contact me with any questions! 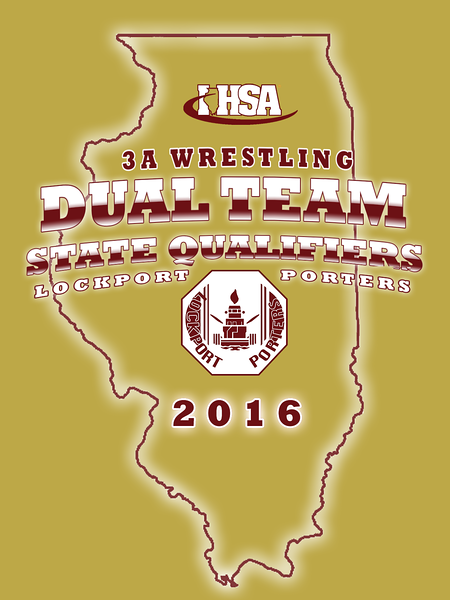 Shirt design for Lockport Township High School Wrestling after qualifying for the Dual Team State Tournament.